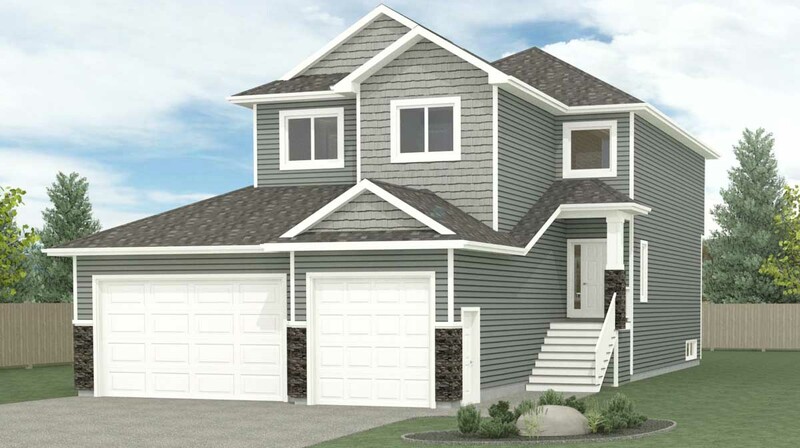 This 2096 square foot two storey truly considers the elements of practical living and hospitality. With our day to day lives often being on the go we have designed the personal boot room off of the garage entry to be next to the pantry as well as an entrance to the boot room from the main foyer. This way those heavy pantry items are able to be organized right away. The entertainment area is spacious with the dining area, living area and kitchen all seamlessly connected in this open floor concept. The 3 spacious bedrooms are nicely tucked away on the upper floor where one can enjoy some peace and quiet or some rest and relaxation in the additional upper family room. You will love spending time in this master bedroom since the ensuite is finished with a freestanding tub, his and her sinks and an elaborately tiled stand up shower. The walk in closet is conveniently attached to the master ensuite to allow your mornings feel accessible. Once you park in your triple car garage and enter your home you will feel welcomed.